Options: 3.5 lb. 9 lb. This multi-species milk replacer is made with high quality protein for sound development, fortified with essential vitamins and minerals, and has a versatile non-medicated formula. Nurtures five species of baby animals: calves, foals, goat kids, baby pigs, and puppies. 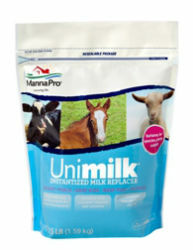 Uni-milk is a milk replacer for calves, foals, goat kids, pigs, and puppies. Please use the following guidelines for mixing and feeding directions. When mixing, add powder to warm water and stir to dissolve completely. Whenever possible, newborns should be fed colostrum from the dam, preferably within two hours of birth. Colostrum feeding should continue for the first 24 to 48 hours.Every animal is an individual and the quantity of milk replacer fed may need to be adjusted from the amounts shown below to support the appropriate body condition and stool consistency. Consult with your veterinarian regarding any health concerns. Calves: Mix 8 level measures of Uni-milk into 2 quarts of warm water. Bottle feed 2 quarts of solution every 12 hours. Foals: Mix 4 level measures of Uni-milkinto 1 quart of warm water. Bottle feed 1 to 2 quarts of solution every 6 hours for the first 3 weeks. Thereafter, bottle feed 1-2 quarts of solution every 8 hours until weaning. For pony foals, feed half these amounts as a starting point. For draft breed foals, feed up to twice these amounts as a starting point. Kids: Mix 4 level measures of Uni-milk into 1 quart of warm water. Bottle feed 2 to 4 ounces of solution every 6 hours for the first week. Thereafter, bottle feed 8 to 12 ounces of solution every 8 hours until weaning. Pigs: Mix 4 level measures of Uni-milk into 1 pint of warm water. Bottle feed 2 to 4 ounces of solution every 6 hours for the first week. Bottle feed 4 to 6 ounces of solution every 8 hours for the second week. Thereafter, bottle feed 10 to 12 ounces of solution every 12 hours until weaning. Puppies: Mix 3 level measures of Uni-milk into 1 cup of warm water. Bottle feed ½ ounce of solution per pound of body weight every 4 hours until weaning. Vitamin A Min 30,000 IU/lb. Vitamin D3 Min 10,000 IU/lb.